St Michael's Church in Mickleham has a squat Norman west tower, topped with a widely flaring spire. 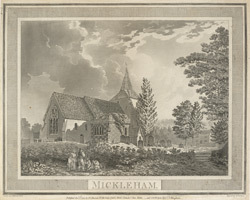 This is how the church looked in the late eighteenth century, when it was still largely a Norman church. It was drastically restored in 1871, and its original Norman and medieval features were largely replaced with Victorian ones in a neo-Norman style.